Organizers of the government-sanctioned protest rally “For Fair Elections” on February 4 have decided who will address the crowd on Saturday and worked out a draft resolution that is expected to be adopted at the event. The resolution urges “an annulment of the falsified results” of the December 4 State Duma vote, political reform, registration of opposition parties, free and fair parliamentary and presidential elections, and the release of “political prisoners.” The protesters will also call on voters to refrain from casting their ballots for presidential candidate Prime Minister Putin. 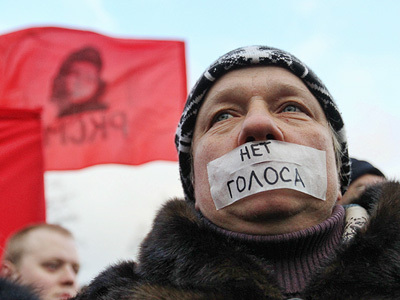 In addition, the resolution calls on protesters to work as monitors at the March 4 presidential poll, reports Interfax. The organizing committee of the event decided that three presidential candidates – Sergey Mironov of Fair Russia party, businessman Mikhail Prokhorov, and a co-founder of Yabloko party Grigory Yavlinsky (who was denied registration) – would be given a chance to have their say at the rally. Communist leader Gennady Zyuganov was also invited to participate. Environmentalist Evgenia Chirikova, the leader of the Movement to Defend the Khimki Forest, and Vladimir Ryzhkov, a co-chairman of unregistered party Parnas, will host the meeting. 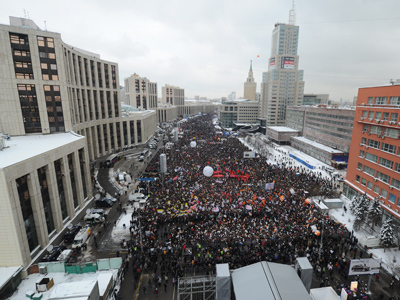 It was agreed that the gathering on Bolotnaya Square should not last longer than 40 minutes due to extremely cold weather. 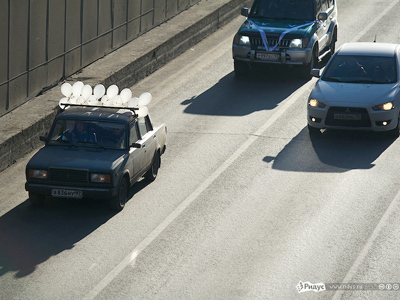 The route of the protest procession will begin near Oktyabrskaya metro station not far from the city center.